Every single door that comes out of our workshop and into your home is custom designed and built by the husband and wife team of Vibe Marketplace. 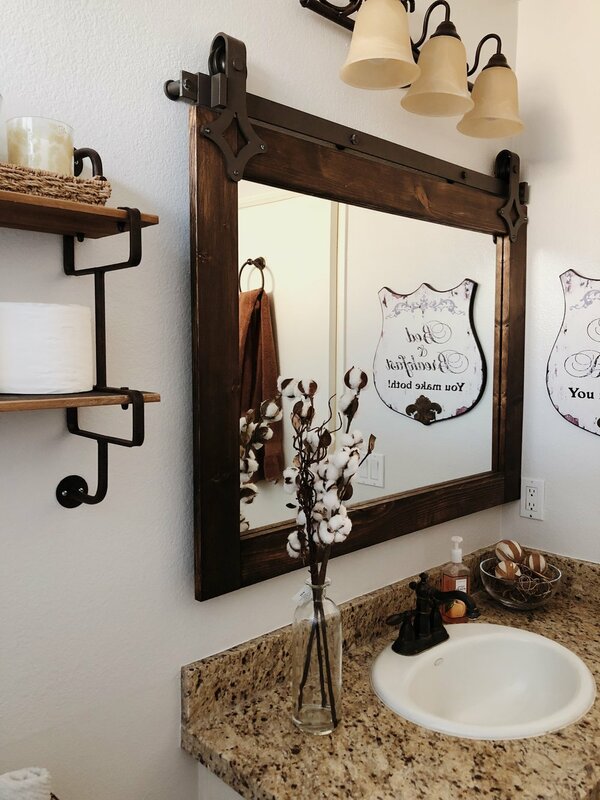 They are fully customizable to your size of space, as well as the color hardware you would like, bracing style of your choosing and whatever stain or paint color you can find! Simply shoot us a text or email with these four things included:  The dimensions of your opening. A picture of the space you would like the Barn Door to cover. A picture of the design, color, and hardware type you would like for your door. And the city you live in. OR You can give us a call and we can set up an in person consultation if you are unsure about how to send any of those details online. How Many Ways Can You Customize a Barn Door? I am SO glad you asked this question! When you hear Barn Door, I bet a certain image comes to mind of a rustic brown door, BUT I am hear to tell we have thought outside that box and come up with HUNDREDS of different designs over the years! We can do any color paint, mixture of stain imaginable; black, brushed nickel, copper, or rose gold track; clear glass, privacy glass, or even mirrors! Where Should I Put a Barn Door? Once we receive your information or come to your house to measure we will then send you a quote. If you are ready to move forward we just ask a 50% deposit to get started building your door(s). Right now we have a lead time of about 3-5 weeks with all of our current orders, so around that time we will reach out to you and plan a time that works well for both of us to come install your custom door. (To install 1 barn door it takes a little under a hour) Once your door is fully installed the other 50% will be due. For methods of payment, we accept: Venmo, Paypal, ApplePay, Checks, Cash, or Credit Cards. What Other Custom Pieces Can We Create? Not only are we in the Barn Door game, we make tons of other great handmade furniture and decorative custom pieces for your home that you can’t find anywhere else! We make custom farmhouse tables (round and rectangular), floating shelves, desks, shiplap walls, entertainment centers, we can fill those odd drywall cut outs for when projection TV’s were a thing, as well as lawn games, lanterns, coffee tables, end tables, benches, etc.